The Republic of Ireland and Preston North End player has undergone surgery for the issue. 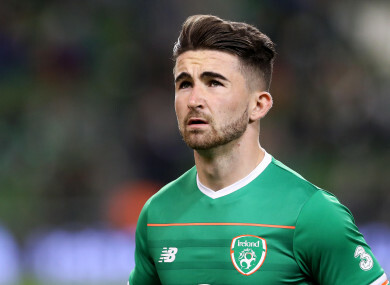 REPUBLIC OF IRELAND’S Sean Maguire is hoping to fit again by February or March in 2018, after undergoing surgery for a serious hamstring injury in recent weeks. The Preston North End striker initially injured the muscle in the middle of October while on club duty for Preston North End. He subsequently completed the full 90 minutes of a Championship fixture against Aston Villa at the beginning of November, but suffered a torn hamstring which ruled him out of selection for Ireland’s World Cup play-off against Denmark. Maguire enjoyed a successful 2017, in which he earned a transfer from Cork City to Preston North End, as well as making his senior international debut against Moldova in October. The injury however, halted his progress. “I think 2018 will be even bigger, once I’m back fit in February/March hopefully there is a promotion push to be part of and there might be a couple of international games later on. “My recovery from injury is going well, I’m where I was expected to be. It is seven-and-a-half-weeks since I had surgery and for six of those I had a leg brace on. “With muscle injuries, you can’t go too overboard with your rehab and can’t get too far ahead of schedule – it is all carefully managed with various stages to go through. Email “Sean Maguire targeting comeback in early 2018 from a serious hamstring injury”. Feedback on “Sean Maguire targeting comeback in early 2018 from a serious hamstring injury”.